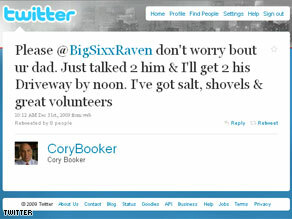 Mayor Cory Booker tweets after talking with a Newark resident who needs help shoveling. New York (CNN) – Need help from city hall? If you are looking for a quick response, you might want to send a "tweet" as well as making that customary phone call. The daughter of a 65-year-old Newark man did just that when she used Twitter to directly ask Mayor Cory Booker to help shovel her dad's driveway on New Years Eve. Ravie Rave, otherwise known as @BigSixxRaven on Twitter, was at work and could not help her father shovel, so she sent a tweet to the mayor asking for assistance. Five minutes later Booker messaged her back. With over 1 million followers, Booker is one of the most active and followed politicians on Twitter, the popular social networking micro blog. Twenty minutes after reading the first tweet, Booker knocked on the father’s door with a shovel in hand. He even had volunteers pitch in to help after seeing the conversation on Twitter. Once the driveway was cleared, Rave tweeted back to Booker. Public service at its best . The man deserves to be re-elected provided he sets it up that his administration does not just help one old man but many when its tough for them like in these conditions. I would suggest that the USA government implement Outgoing Immigration. Incoming Imigration is not sufficient. This will assist in the screening and identification of some of these terrorist moving through the USA to other parts of the world to carry out their acts. God Bless the kind hearted Mayor. Politicians are supposed to be for the people and represent the will of the people. Take note Obummie. We don't need your ignorant policies but if you want to shovel my driveway, come on down. That just got him into office. Smart move and thanks for helping your neighbor, elderly on top of that. People in this comm. should be proud of a man who went above and beyond for his town folks. Great story , and Obama isn't even in the story line, YEA! Now that's a Mayor you can beleive in. Booker is a good politician. He reminds me of Mayor La Guardia. Regardless of this Mayor's political affiliation (undoubtedly a Dem by his willingness to do his job), he is a model for politicians everywhere to put aside personal differences to help the common man. Kudos to Mayor Booker!